Central Coast living means we don't really have a winter. Which believe me, I'm 100% ok with!! It was an 80 degree day, which was perfect for wearing this jumpsuit. I purchased this belt a while back from Savers, but because it's so oversized, I was having issues figuring out what to wear it with. This jumpsuit was the answer!! Because of it's bold pattern and a flowy top, it made my belt blend in a bit. To finish off my look, I'm wearing platform sandals and mirrored sunglasses. Lets be honest, I'm not a huge pearl fan. You won't find me wearing pearls around my neck, but for some reason when you put them on jeans, I'm IN! I'm so over boring jeans, so I'm all about ripped or embellished ones. It just makes every outfit cuter! Plus adding in thrifted boots and a vintage fringe jackets makes for a unique look! I'm back with another thrift store hack!! This romper is from Savers, and I loved everything about it except its length and the chain that went across the front from button to button. With the help of my mom, we hemmed the shorts a few inches, and I took off the chain. Easy fixes!! For the rest of my outfit, I added a Tobi denim crop top, Latigo sandals, Neiman Marcus choker and Quay Australia sunglasses. Sorry I've been MIA on the blog for a bit! Wedding season has been in full swing, so I've been busy with that. 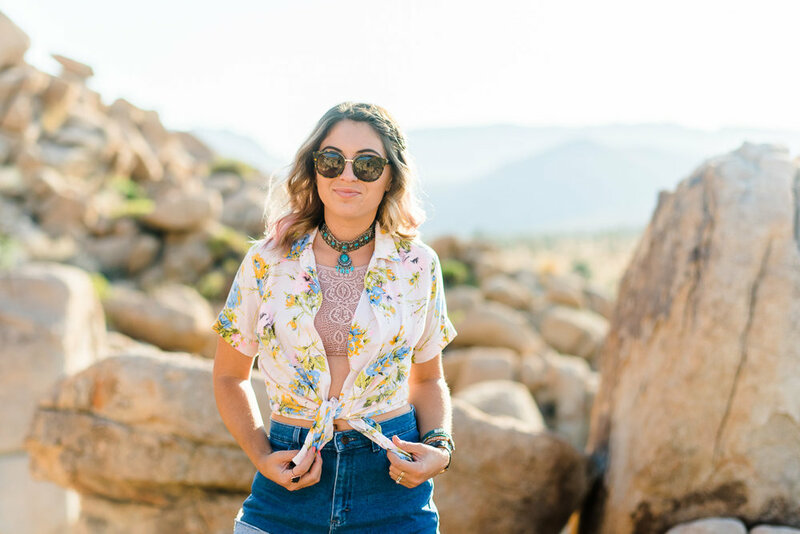 But today I'm sharing all my favs from our desert shoot in this thrifted outfit!! This floral button up is fairly boxy, so I decided to tie it instead of button it. It gives it a totally different look and is perfect for wearing with high waisted shorts. Since I opted to tie it (which exposed more skin), I added a Three Bird Nest bralette underneath. For my shorts, these are also thrifted, and I cut them so they were shorter which also allowed them to fray on the bottoms. 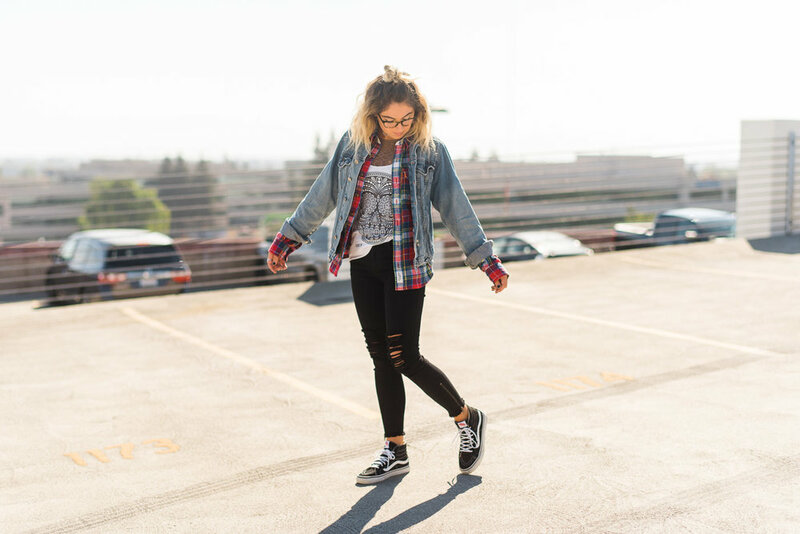 These quick and easy thrift store hacks are perfect for making your "old" clothes more boho and modern. For my accessories, I added a Steve Madden choker and my new green Vans! 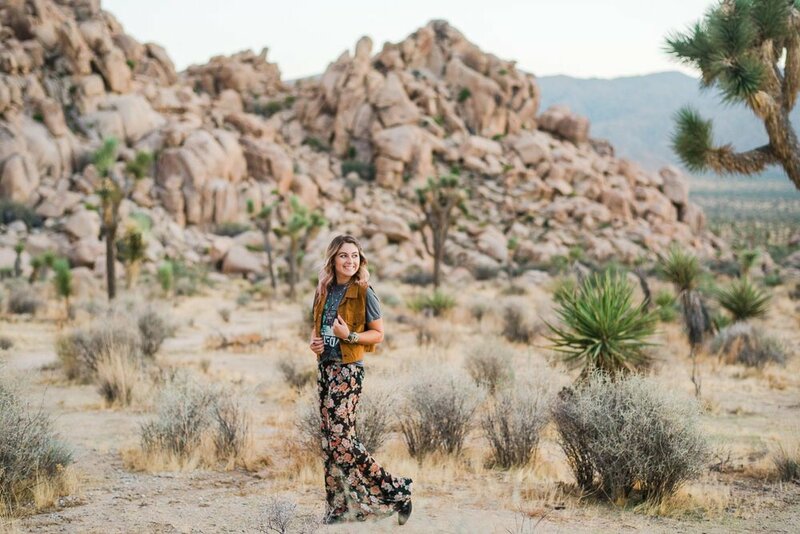 If you haven't been to Joshua Tree, you HAVE to go!! It's stunning, and totally looks fake. I love the desert landscape and the amazing sunrise. Plus it makes for the perfect backdrop for photos!! I always struggle to find cute high waisted shorts and pants, and from what I hear from others, it's a struggle for everyone! So when I came across Vintage Chameleon on Instagram, I was so excited! Their shorts are vintage denim and they have a ton of high waisted options. I'm also a sucker for a good ripped jean, so these shorts make me extremely happy! Every few weeks my mom and I hit up a thrift store (or two). I usually leave with a few items, and some trips I leave with something that makes me really excited, like this floral print denim jacket! It's always a toss up whether you'll find something cute at a thrift store AND if it will fit, so I was very happy about this jacket. This outfit is full of a whole lot of DEALS, so this post is sort of a piggyback off yesterdays post! Let's start with my shirt. If you follow me on Instagram then you saw that I went thrift store shopping recently at Savers and bought this hot pink, fruit print shirt. My mom first pulled it off the rack, thinking it was funny (& maybe ugly), and to her surprise I actually loved it! She of course laughed at me, but after trying it on, she agreed that it was cute. It was super wrinkly at the store, but I knew when it was washed and paired with the right outfit, it would probably become one of my favorite shirts. If you're like me and like to shop, but don't want to spend too much, then these 7 tips are for you! I've learned a lot of ways over the years to get cute clothes and fill my closet while still coming in under budget.